In particular, community solar projects are gaining popularity, as they allow the almost half of U.S. households that may not have access to a “solar-ready” roof to take advantage of the sun’s energy and do it at a lower cost. This can make solar accessible to more low- and moderate-income (LMI) communities. Between 2010 and 2015, community solar installations grew rapidly, reaching almost 100 megawatts — and this business model has even greater potential. 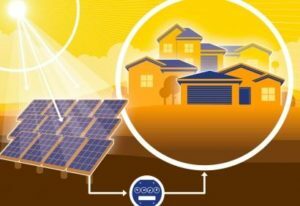 The National Renewable Energy Laboratory (NREL) estimates community solar could comprise up to half of the distributed PV market in 2020…. Though this is a very basic analysis, it illustrates that solar is quickly becoming one of the most cost-effective sources of energy for all Americans, regardless of where they live. However, a recent report by the George Washington University Solar Institute shows that while 49.1 million households earn less than $40,000 of income per year and make up 40 percent of all U.S. households, they only account for less than 5 percent of solar installations. Providing the means for all communities to benefit from solar energy will help the U.S. meet its climate goals while also helping to create a fair market for solar that allows everyone, regardless of where they live or their financial status, to benefit from clean energy. Construction of a community solar project is well underway to benefit Eversource customers throughout Western Massachusetts. 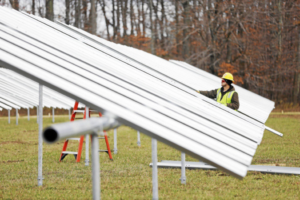 The three separate solar arrays being installed on the grounds of Hancock Shaker Village should be completed around Jan. 1 and hopefully operational early next year, according to Syncarpha Solar LLC. The New York City-based firm, partnered with Renewable Energy Massachusetts, will have a 1-megawatt array on the Pittsfield-side of the living museum along Route 20 and two, 2-megawatt facilities in the town of Hancock. Collectively, the solar energy generating system will feed the electricity produced into the Eversource power grid, and the three array ownership entities would be set up as Community Shared Solar facilities. That means residents of the Berkshires who are Eversource customers can buy energy net-metering credits at a discount and realize energy savings, project officials have said. “You can subscribe for net-metering credits before [the project] is up and running,” said Matt Preskenis, Syncarpha’s vice president of community solar. Hancock Shaker Village also makes money off the project as the developers’ facilities would provide lease income for the museum for up to a 30-year period. The developers plan to install at least a seven-foot fence around the arrays and properly screen the Pittsfield site with natural vegetation to minimize the visual impact to neighbors across Route 41. Syncarpha views the Pittsfield/Hancock solar arrays in keeping with the museum’s mission of sustainability. “It really goes along with the value of the Shakers,” said project developer Keith Akers. For information on the Hancock Shaker Village solar project, go to www.syncarpha.solar.